New Item Only One Available! This mr2 Signature solid cherry Tree Trunk Table with Live Edges, Hairpin Legs and hand finished surfaces was made from a cherry tree that was damaged in a storm. The tree stump was salvaged from wood that was going to be burned after the storm. The piece has beautiful cracks, variegations and grain patterns in the wood which include flames, burl like swirls and color variations. The table is 27" Wide x 27" High x 23" Deep. The cherry tree trunk was taken to a saw mill and cut into uniform and parallel slices to insure a uniform thickness and level table top. All of the surfaces were hand planed, fine sanded and the bark kept to preserve the natural beauty of the edges. All the surfaces were fine sanded prior to the sealer being applied. 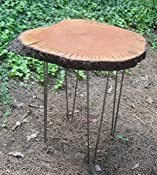 The piece is shipped with the Hairpin Legs removed for safe and economical shipment of the table The piece has 9-10 coats of polyurethane lacquer. All the surfaces are hand sanded after each application of lacquer dries 24 hours. Shipping and insurance costs are estimated for delivery to the West Coast (See Shipping & Policies). If less, a refund is provided when shipped. mr² Woodworking also creates custom indoor and outdoor furniture, benches, cabinets and specialty wood items available.